Let us show you what fast, friendly, strategic and responsive IT support can do for your business! Tired of slow and unresponsive IT support? FLAT FEE MANAGED SERVICES THAT KEEP YOUR BUSINESS RUNNING. Together, we translate your company’s needs into technology implementations—strategically, efficiently and cost-effectively. Why Us is actually ALL ABOUT YOU. We are a small business, not unlike yours. We understand the business needs that drive technology and are the trusted partner that knows how to deliver them to your business. Whether it’s networking, infrastructure, or servers backups, you have access to our team of engineers who procure, design and deploy A UNIQUE TECHNOLOGY FOOTPRINT THAT FITS YOUR BUSINESS. Which part of YOUR business belongs here? STRATEGY IS PARAMOUNT WHEN DECIDING WHEN, WHERE, WHAT AND HOW TO MOVE TO THE CLOUD. Established in 2001, Xirtix Consulting helps premier Houston Businesses to implement, manage, and maintain their IT infrastructure. Whether it’s managing your cloud technology, designing a strategy, keeping your systems updated and protected, or backing up vital company data - Xirtix Consulting is the one you turn to. Expect your IT worries to be addressed quickly with our high Service Levels and never feel the burden of downtime. In other words, we offer IT solutions so that running your business should be your only priority. Director of IT Shipping and Logistics Firm, North America. 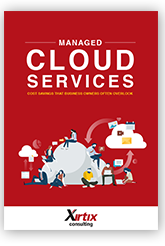 This eBook covers the top 12 benefits of outsourcing cloud consulting and support so you can move beyond vague talking points and into the realm of detailed insight. I only gave this job a "very good" because the problem went away and came back, so it had to be addressed a couple more times. Your guys are great Nick and always very polite and helpful. You really know how to pick them. You had a representative assigned to the problem quickly. Fortunately we were able to resolve before Xirtix had to spend the resources to address/ resolve. The Xirtix staff has always been very helpful and punctual in addressing out office needs. Fred worked with Glasgow and Gothenburg to get me set up to use inside.stena.com. It took a little longer than I expected, but that was all on Glasgow and Gothenburg. As always, Xirtix delivered.